Long Mulberry Silk Fibres … Made Even Better! A high quality washable and dust mite repellent Mulberry silk fibre. How is SilkFX® better than Mulberry Silk? Easy care silk duvet that can be washed at the convenience of your own home. No need for professional laundry. Keeps you warm and comfortable. Effective double insulation with hollow fibre core and high heat retention abilities. Adjusts to the body´s sleeping temperature and reduce nightly wake-ups cause by overheating. Cleaner and healthier bed environment. Silk is naturally anti-bacterial due to its thin layer of silk protein (Sericin). No allergy reactions are causes by silk. Silk is a natural material and do not cause allergic reactions in humans. Reduces night sweats and damp sleep environment. Keeps you dry and comfortable throughout the night. Let your body breath naturally and reduce nightly overheating. Silk is highly breathable due to its thin and very fine structure. 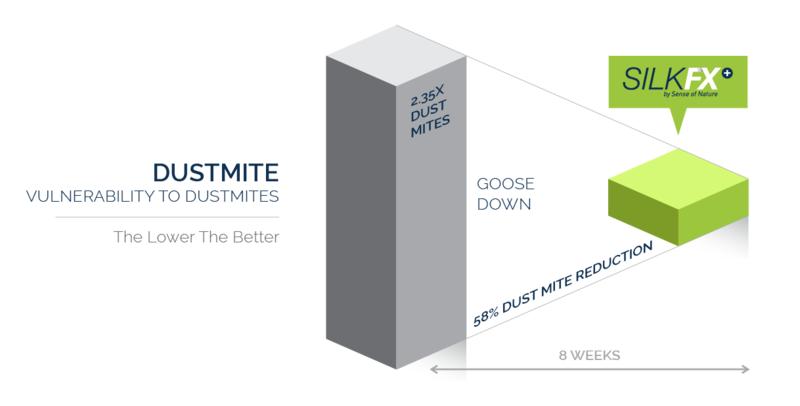 SilkFX® actively reduces 58% of living dust mites after only 8 weeks, without the need to wash at 60 degrees to kill the mites. 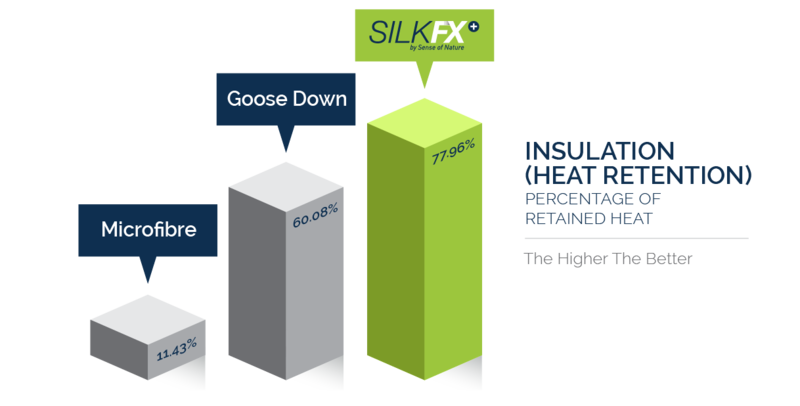 SilkFX® retain 29.76% more heat than Goose Down and more then 5x times that of Microfibre (Polyester). 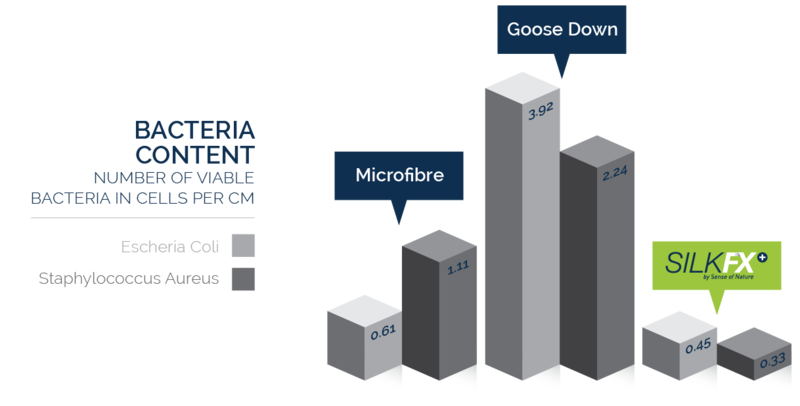 SilkFX® shows half the bacteria growth rate to that of Microfibre (Polyester), with Goose Down bacteria growth rate being more than 6x times that of SilkFX®. 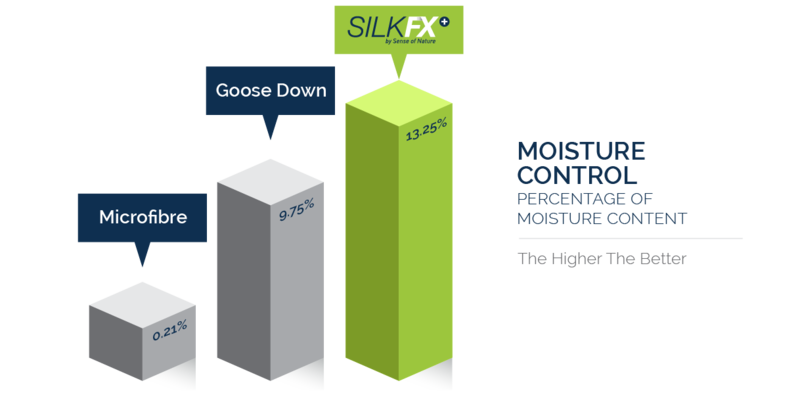 SilkFX® retain 35.90% more moisture than Goose Down and a massive 62x times mores then Microfibre (Polyester). 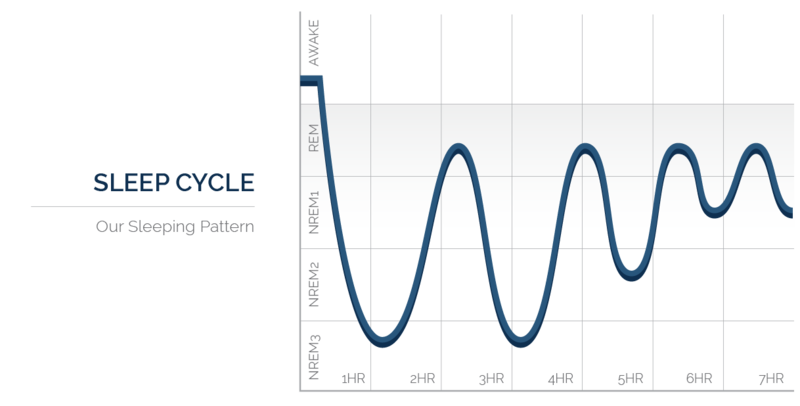 SilkFX® thermoregulation (heating/cooling) follows the human sleep cycle, resulting in less overheating, less sweating, and a more comfortable sleep at ideal sleep temperature.